Home » TTAC Fears the 2011 Mustang GT…? TTAC Fears the 2011 Mustang GT…? 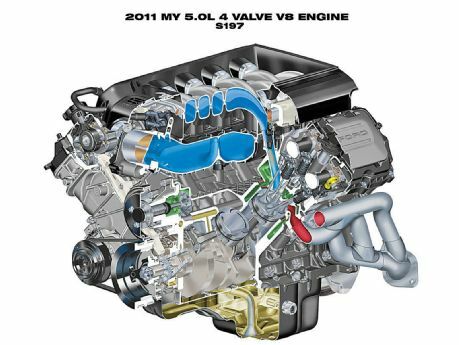 TTAC today released an editorial titled “Do Not Buy A 2011 Mustang 5.0“: http://www.thetruthaboutcars.com/editorial-do-not-buy-a-2011-mustang-5-0/ They claim to have discovered that Ford’s new 5 liter V-8 will get direct injection (D.I.) one day soon. TTAC didn’t discover anything new at all. Ford engineers already revealed that the engine and heads made “accommodation” for D.I. during the interviews they gave in the press rollout months ago. Several magazines were savvy enough to report it at the time as well as the fact that the 3.7 will also go to D.I. at a future point in time. And other engineers have publicly – although generally – discussed the overall rollout of D.I. inside Ford over the next several years. Furthermore, reacting to a few misinformed comments on their “editorial”: no, the reason the current 5 liter has port injection has absolutely nothing to do with somehow favoring the aftermarket or “drag racers”. That’s ridiculous. That’s not how business investment decisions are made or how Government mandates are met. The decision to forego D.I. in this first iteration of the new 5 liter has solely to do with cost, and the new engine’s ability to meet its performance objectives (meaning emissions and fuel economy) without the extra cost of the D.I. hardware required. When D.I. does get here some day, the engine will have even better drivability, as anybody knows who has owned a car with D.I. And better torque, HP, mileage, emissions, and A/F precision. D.I. is one of those technologies which do nothing but good. The engine will probably also get a compression ratio boost (note Mazda’s new D.I. 4 cylinders – featuring 13 and 14:1 compression!!) at the same time, which will improve torque even further. As for the aftermarket, remember that the ’80s Mustang created the modern aftermarket, almost single handedly. And Mustang tuners have met and exceeded every single technology challenge handed to them – including Port Injection. When port injection came out in the Mustang (’84 SVO first, and the 4.9 liter V-8 in ’86) the fear mongers told everybody to “get a new Mustang before P.I. comes out”. Ridiculous then, very quickly disproven, and just as ridiculous now. We were there, with both an SVO and an ’86 GT. Our ’86 had fabulous drivability compared to the earlier ‘83-85 GT with its poorly tuned Holley carb, ridiculous A/C idle override, crude cold-weather start, and frequently blown diaphragms. Good riddance to that. There’s lots more technology from Ford coming in the longer term, including variable valve lift – which is once again an emissions and mileage-driven change but which again will mean even more performance for us all. And when the next-gen Mustang comes out and hopefully drops a couple of hundred pounds (and adds the IRS), our world will get even better yet. And we know that at roughly the same time the Camaro will also move to a lighter platform, and make a switch to an all-new OHV cam-phased direct-injected V-8. Time marches on.